Andrew Saladino’s video essay about the cinematography in Yasujiro Ozu’s Floating Weeds, 1959, isn’t the most innovative or the most profound or the most theoretically rigorous analysis of this kind. But it is beautifully assembled, is genuinely informative with an engaging tone, and it highlights both verbally and visually elements of great and glorious beauty. Open your eyes… (and for more about Ozu, pictured above, and the film, see the links below). Quiet Cinematography- Floating Weeds (1959) from The Royal Ocean Film Society on Vimeo. • Floating Weeds: an introduction to the film by David Ehrenstein, written in 1989. • Stories of Floating Weeds: a 2004 essay, courtesy of The Criterion Collection, in which the great scholar of Japanese film Donald Richie compares Ozu’s 1959 film with his earlier A Story of Floating Weeds (Ukigusa Monogatari), 1934. • Saluting a master of the cinema, Yasujiro Ozu: an introduction to Ozu’s oeuvre, from Roger Ebert, penned in 1989. 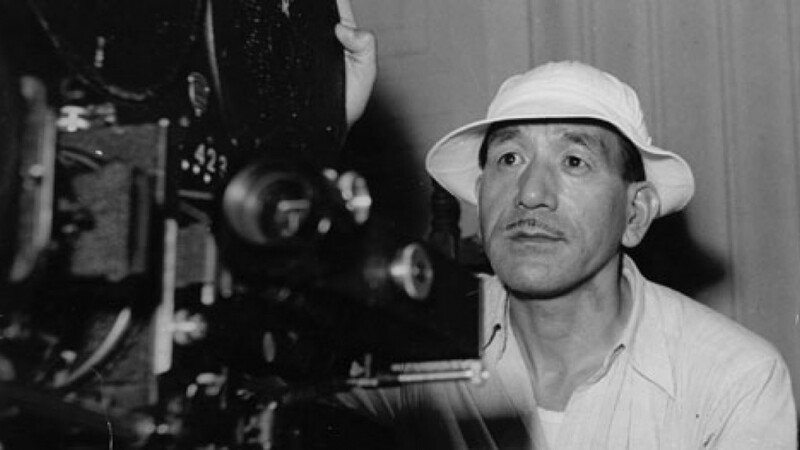 • Yasujiro Ozu: a fine ‘Great Directors’ profile by Nick Wrigley for Senses of Cinema. • Re-examining Yasujiro Ozu on film: Mark Schilling for The Japan Times in 2013. • Ozu-san.com: a website devoted to the director with a wealth of resources. • Watch again! Look well! Look! (For Ozu), from 2013. • A modest extravagance- four looks at Ozu, from 2011. And then here, via a link to the University of Michigan, you can download a .pdf of the whole of Bordwell’s foundational book, Ozu and the Poetics of Cinema, first published in 1988. It’s a hefty 412 Mb but worth every byte. The section on Floating Weeds, 1959, begins here. • Yasujiro Ozu – the depth of simplicity: and if you’re still keen to see more, here’s another video essay, this time from Channel Criswell, about Ozu’s style thoughout his long and immensely distinguished career.